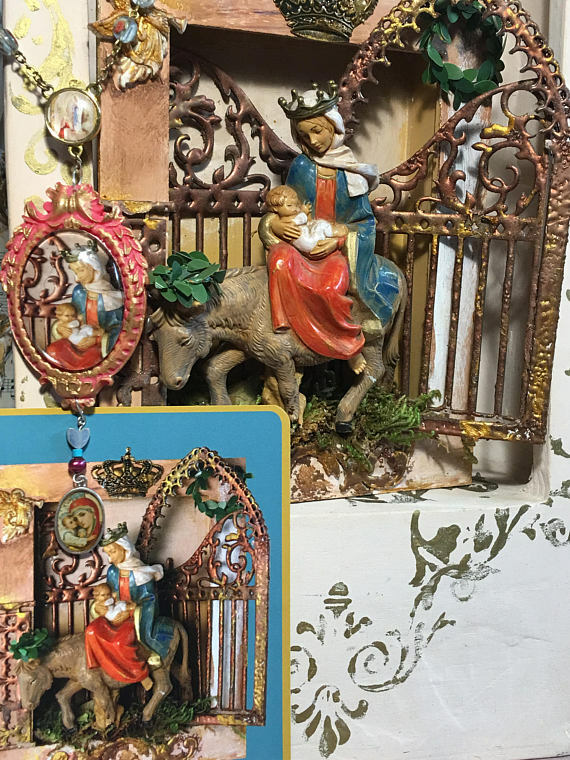 Mary as the Gate of Jerusalem and Madonna of the New Dawn. 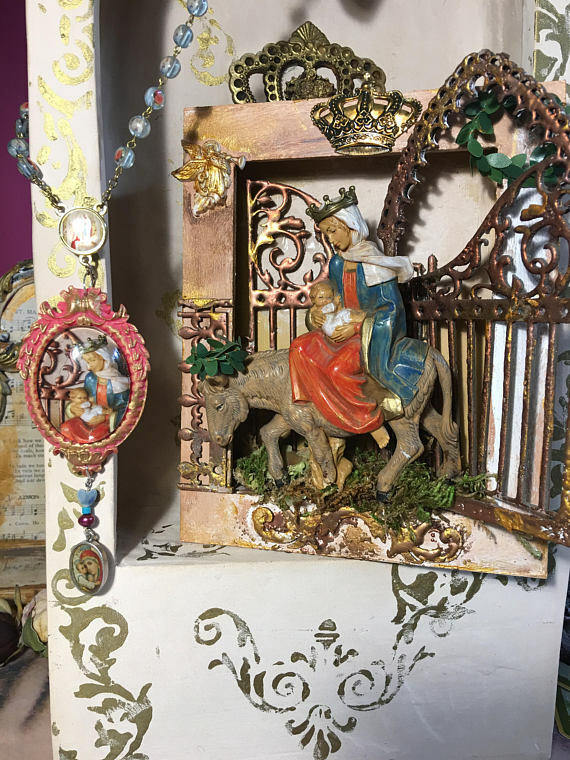 Each one of the tarot cards of the Mysteries of Mary tarot deck represents an initiation, a mystery and an archetype in the story of the Great Mother, Queen and Woman of Love, starting from Isis, through Asherah, Miryam, Mari and Mary. 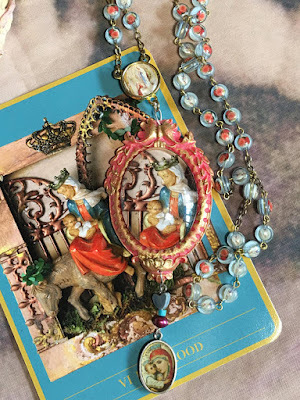 The vignette of Mary entering the Eastern gate of Jerusalem is under a glass bubble in a coral baroque lightweight frame and a unique rosary which I brought back from Lourdes with a small icon of the Madonna of the New Dawn set in a sterling silver bezel. 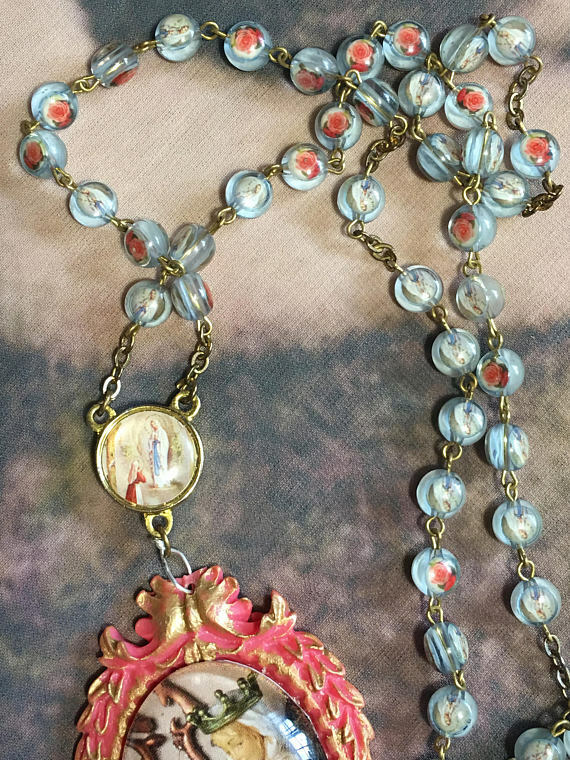 Each bead of the rosary has a miniature image of the Madonna on the one side and a coral rose on the other side. 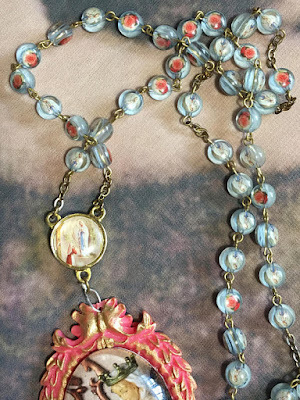 The colour of the rose is an identical match for the coral frame of the cameo. The rosary centre has a drop of sacred water from the spring at Lourdes. This card is the VI in the suit of Holy Rood, traditionally Wands and this is the triumph or victory card. The Eastern Gate is one of Mary's many titles. The Eastern Gate in the old city wall of Jerusalem is the oldest gate and also known as the 'Golden Gate', 'the Beautiful Gate' and the 'Gate of Mercy'. It is also the only gate that was sealed five hundred years ago and is still sealed. The Hebrew Mother Goddess Asherah was known to be the consort of Yahweh. In the time of King Joshua's eradication of the goddess, the Hebrew goddess had to go 'underground'. The use of her name and images were forbidden and her devotees replaced with the tree, a pole or rod and the branches of the menorah. She was known as the Lady of Jerusalem, the Gate of Jerusalem and the Eastern Gate. The Lady of Jerusalem was also depicted as an arch. The tarot deck fits together the myth and metaphor as contained in Egyptian, Jewish, Greek, Christianity and the various Gnostic teachings (amongst others) of the feminine and masculine Christ and the inner Sacred Marriage. You can read more about my tarot deck and book at www.hergracesacredart.com. With the purchase of this rosary you will receive the tarot card for your altar. If you buy it with the complete tarot deck and book set you can buy it at a discounted price. 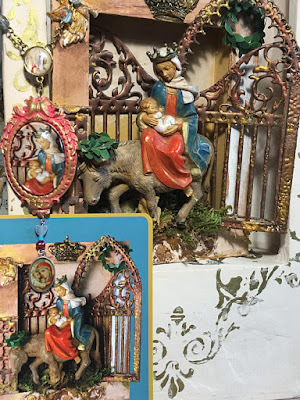 The price for the rosary is $58 (first option at checkout) and with the purchase of the tarot deck and book set (all-inclusive $89) it is offered at $40. The full set and the Miraculous Medal rosary costs $129 - Option Rosary and Tarot Deck on the checkout.